Map of Hankou at the height of the Second Sino-Japanese War. 最新漢口市街詳圖 / New Detailed Street Map of Hankou. / 附武昌漢陽市街圖 / Annexed Street Map of Hangyang, Wuchang. / 漢口附近圖 / Map of Hankou's Surroundings. 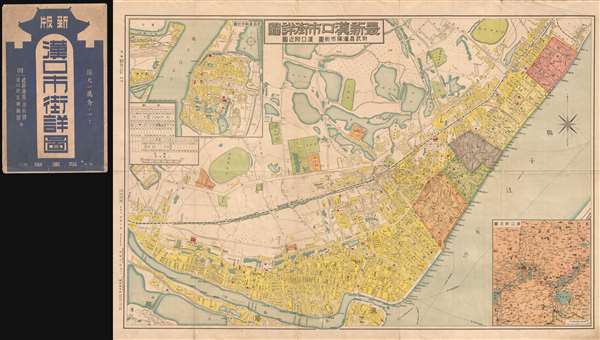 This is a scarce 1939 or Showa 14 Taro Nishizawa (西澤, 太郎) city map or plan of Hankou, China issued during the Second Sino-Japanese War (1937 - 1945, 抗日战争) shortly following the fall of Wuhan and Hankou in 1938. Today these maps are quite rare and offer valuable historical information regarding the Japanese invasion of China. The map illustrates the city of Hankou from the Hanshui River to the Yangtze River and from Hankou to the middle of the Yangtze. Highly detailed, the map focuses on the international concessions along the Yangtze, with each country's concession shaded in a different color. Important wartime locations are identified, such as the Japanese barracks near the train station. An inset map in the upper right corner illustrates Wuchang and Hanyang. Another inset, in the lower right, expands the map's coverage to the surrounding region. Today, Hankou is one of three cities (along with Hanyang and Wuchang) that merged to form the modern-day municipality of Wuhan. In 1939, the three cities were independent but maintained very close ties. During the Second Sino-Japanese War, some of the most meaningful battles centered around the three cities. Engagements were fought on both sides of the Yangtze, lasting a total of four months, ending in October 1938. Being situated midpoint on the Yangtze River, the three cities were critical to inland navigation and consequently the defense of China. To add to their importance, after the fall of Nanjing in December 1937, Hankou became the de facto capital of China. During the war, Hankou's defense was personally commanded by Chiang Kai-shek. Even so, the city eventually fell in 1938. Nonetheless, due to the ardent defense, and the high casualties endured by the Japanese, no further offences could launched in China until 1944. This map was drawn by Taro Nishizawa (西澤, 太郎) and publsihe din 1939. Nishizawa Taro (fl. c. 1931 - 1940), or 西澤太郎 was a Japanese cartographer active during the Second Sino Japanese War. He may have been a military surveyor attached to the Central China Expeditionary Force under General Shunroku Hata. Very good. Accompanied by original paper sleeve. Minor wear on original fold lines. OCLC 1020948902. Gaisho Code その他. NCID BA48592616.